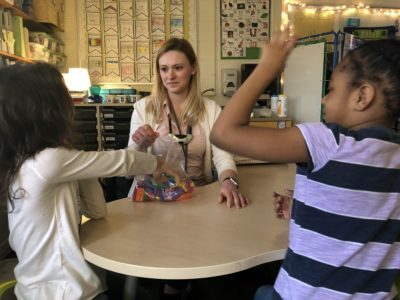 When she was asked to nominate a teacher for the weekly Exceptional series of profiles, Thurston Principal Natasha York said that while every teacher in the school was a candidate, her first thought was of the trio of first grade teachers. 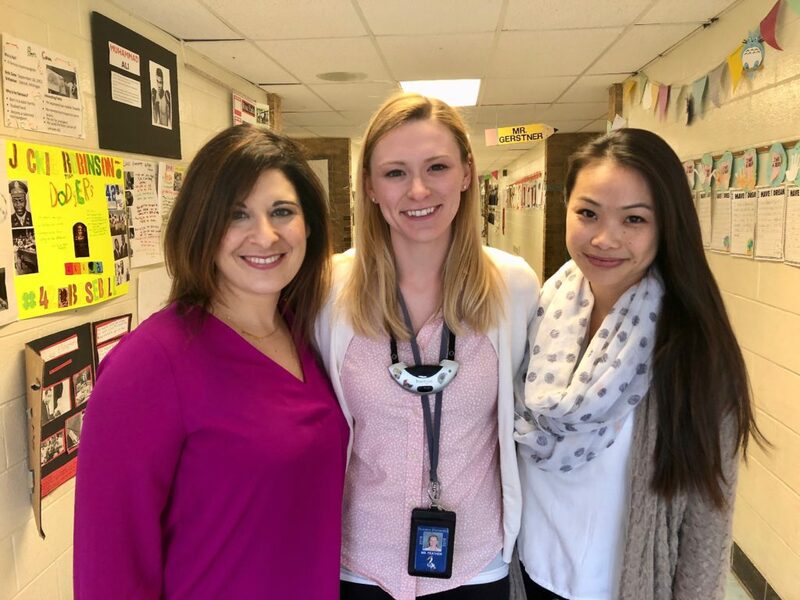 Chi Wan Yip, Jenna Salm, and Hannah Feather, she said, are an exceptional team of educators. They bring a diverse level of skills that they bring to the table together, she noted. “Whether it is the new tech-savvy concepts of the two-year rookie teacher or the creative and innovative approaches to instruction offered by the fifth year teacher or the overall expertise of instructional and professional practice offered by the 10-year veteran, the mix between the three is surreal,” says York. The teachers say that when they noticed they had similar styles of teaching, their collaboration naturally evolved. 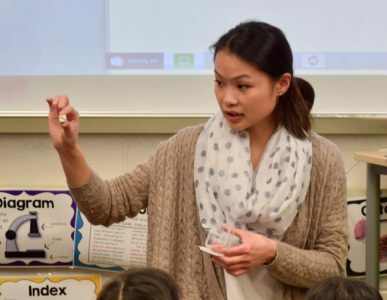 “Our collaboration has really allowed us to maximize our instruction and be more effective with our time,” says Chi Wan Yip. 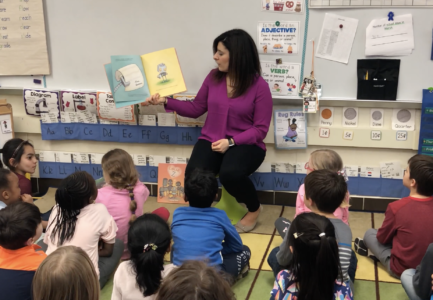 “Our students also really enjoy the First Grade activities that bring together all three classes that celebrate the great work we do within our classes—from Reindeer Party and 100s Day Celebration to March is Reading Month activities and more. Jenna Salm has taught at other schools where she worked mostly independently. That was good, she said. But collaborating is better. She says the three meet at least once a week, and often get together on Sundays. “It’s a great way for us to prepare for the week together and have a chance to talk and catch up,” she says. “However, we always know we can drop in each others’ classroom or text after hours if we have an idea to share. Alma mater: Michigan State University. How many years at AAPS: Five. What makes a good day at school: Each day at school is different and that’s part of what makes it so great! I know I’ve had a great day when my kids are asking good questions, are excited, and making great connections! One of my favorite things to hear is, “So, Ms. Yip, what are we going to learn today!?”. It shows me that the kids are excited to learn from me and from each other. That excitement and drive for learning are what makes a great day at school. Your students: Each first grader brings in their own culture to the classroom that introduces me to new perspectives on compassion, learning, persistence, friendship, forgiveness, and understanding. Their drive for learning and their curiosity is inspiring and we learn new things together all the time! My students inspire me to continually look at familiar things with a renewed sense of curiosity and wonder. Jenna Salm: Jenna is the rock of our team! She’s our go-to person whenever we have a question about the curriculum, the problem-solver whenever issues arise, and an advocate for our students and for us! She foresees things that we need and problem solves them for us before they even happen. And when we go to her for help, she either has the answer– or she’s already stopped what she’s doing and on her way to helping us find the answer! She teaches me to be a better advocate for myself, for my students, and for my practice every day! Hannah Feather: Hannah always has fresh ideas to share with the team and great new resources and innovative technology that she shares with us to enhance our instruction. She is so easy-going, positive, and always up for whatever crazy ideas we throw at her! As a team, whenever new ideas come up, Hannah is always on board and finding ways to help. She’s a great team player and she teaches me to be more adaptable and flexible in my practice. Which of your traits and skills most benefit the first grade team? I love coming up with new ideas to make our instruction more engaging and effective. Whether it be making instructional games, Morning Meeting routines, differentiated activities, or spreadsheets to track our students’ progress, I am always trying new ways to improve the learning experience. What are your tips for successful collaboration with fellow teachers? What I love about my team is that we all share the great work we do in our classrooms and we work together on bettering our practice, instruction, and teaching every day. While we work together on developing and organizing instructional content, we take these tools and deliver them to our classrooms in our own way. I think it’s important when you work on a team that you work together to build great content but recognize and respect that it might not look the same in each classroom. I’m really proud of the curricular activities that we have designed because they really bring together our collective strengths, while still supporting our individual styles of teaching. Alma mater: The University of Michigan, both undergrad and grad school. How many years at AAPS: 11. What makes a good day at school: A great day at school is when we are all engaged in what we learning and our enthusiasm and energy are fueling each other. I love when a topic takes us deeper into something and it shows that the students are really thinking about the world around them. Your students: This year, my students have taught me how to turn energy and enthusiasm into productivity in our classroom. They are an awesome group of kids who love learning new things and approach each day with a great positive attitude. Taking all their strengths and energy and transforming it into great learning and growth in new and creative ways has been the biggest take away this year. Hannah Feather: Hannah Feather is the brightest ray of sunshine. She approaches every day with the most infectious smile and positive attitude. She’s taught me new, innovative ways of creating an inviting, peaceful, and calm daily environment for kids. Chi Wan Yip. Chi Wan Yip is our guidance system. She keeps us focused. She’s extremely organized and creative. She’s always finding interesting ways to make cross-curricular connections and integrate student learning. She has taught me the importance of using every moment in the classroom to its fullest. What do you most want to say to the parent of a first grader on the first day? On the first day of school, I would love to tell parents to “buckle up.” They will witness incredible growth in their child this year. Students come into first grade as kindergartners and depart for second grade as independent learners who ask thoughtful questions, discuss their thinking, and take responsibility for their learning. The transformation is unbelievable! Which of your traits and skills most benefit the first grade team? I think my most valuable asset to the team is my experience. I can share with my colleagues things that I’ve learned over my 12 years that have helped me improve my practice. What are your tips for successful collaboration with fellow teachers? My tip for successful collaboration with fellow teachers is that you have to have an equal commitment to the collaboration. I think one of the reasons why we work so well together is that we all want to provide our students with the best experience possible. We all value each other’s expertise, strengths, and talents and recognize that our students benefit more from our combined effort. Therefore, all three of us are constantly looking for ways to ensure that happens. Alma mater: The University of Michigan. What makes a good day at school: The days that are best for me are the ones where children are truly engaged and excited about their learning. Being part of a child’s “ah-ha!” moment is immensely gratifying. Your students: This year, my students have taught me that kindness can prevail in any situation. The relationships I have worked to build within the classroom are helping children see the good in others. We have a “kindness reporter” whose job it is to acknowledge the kind acts that occur in our classroom. I am always amazed by the number of kind acts they see during our day. Jenna Salm: Jenna has taught me the importance of being a strong advocate for my students. As teachers, we know our students best and need to be vocal in getting the supports and services they need to succeed. Chi Wan Yip: Chi Wan has helped me learn how to creatively integrate subjects to help cover our dense curriculum. She has also been a great model for me with classroom management. Which of your traits and skills most benefit the first grade team? I am really good at being flexible and trying out new ideas and activities. Being the newest teammate, I contribute fresh ideas and resources. What are your tips for successful collaboration with fellow teachers? I think one of the biggest hurdles with collaboration is finding a common time to meet with your teammates, so finding a time that works for everyone is essential to the process. One thing that makes our team really strong is that we all bring our individual strengths and work together for the collective goal – our students’ growth and success. Therefore, I think it’s also really important to know each other’s strengths and play off those when working together. My daughter had Ms. Salm last year for first grade. Ms. Salm is that one teacher you will never forget. She is gifted and talented beyond measure. I was hoping Ms. Salm would move up to 2nd grade and teach my daughter again but I guess I had to share her with others. . I can’t say enough about my experience with Ms. Salm. I had the highest expectations coming into Thurston since my daughter was in a private school for Kindergarten. Ms. Salm blew me out of the water. I couldn’t ask for a better teacher. Ms Salm will continue to be in our lives as we care for her like family now. The BEST teacher…hands down! Ms. Salm we LOVE you!!!! I have said this as well that all 3 first grade teachers were a powerhouse. You can’t go wrong with either teacher. All 3 are unbelievably talented and they have genuine care and love for the students like they were their own. Thank you for writing this article! These three teachers are really a very special trio who works together to meaningfully change the lives of the Thurston first graders. I hope that they receive special recognition for all their hard work and dedication!